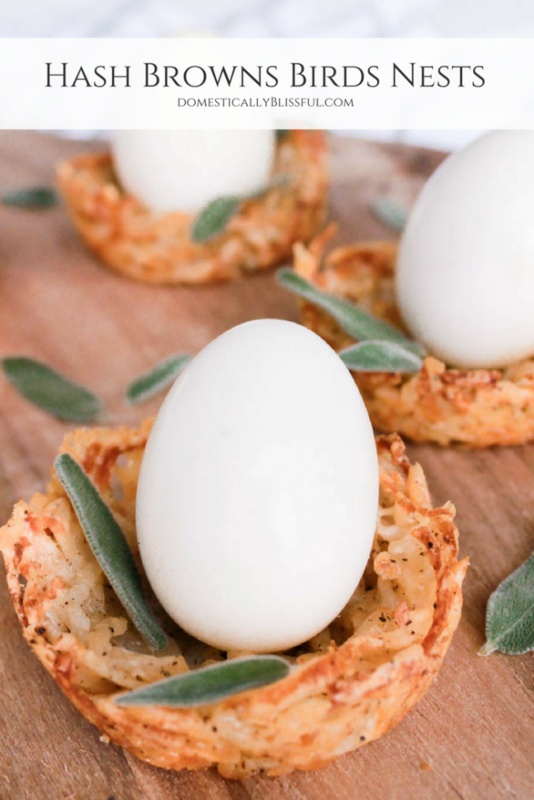 These individual Hash Browns Birds Nests are the perfect savory brunch recipe for spring & Easter! I spend an incredible amount of time on Pinterest. Mainly scheduling pins for work, but occasionally for fun. 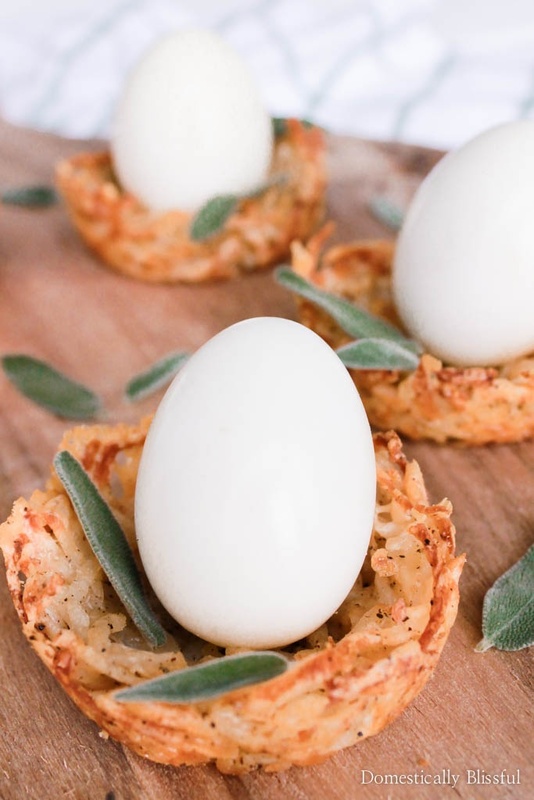 A few weeks back, as I was endlessly scrolling through Pinterest I found an adorable picture of hash browns in the shape of an eggs nest with three little hard boiled eggs in the center. I clicked on the link, that took me to a website that made me slightly question if the picture had been stolen & reused. 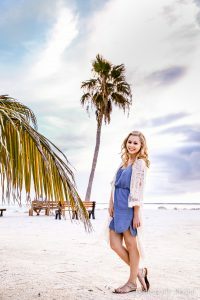 I tried to search the picture on Pinterest & then on Google, but I could not seem to find the original source. Of course, after all of this research, I completely forgot to save the pin I originally found. So not only was I bummed that I couldn’t find the original photographer/creator, but also because I can’t find the image I had originally found online anymore. So with the memory of the picture still in the back of my head, I decided to try my best to recreate the image. The first problem I ran into was trying to find mini eggs to hard boil. I knew if I called around I could probably find a quail egg at a specialty store but for some reason the idea of boiling a little quail egg kind of freaked me out. And while it would be adorable to have 3 tiny edible hard boiled eggs in a hash brown birds nest, I decided to go to plan B.
I decided this was the most logical solution as medium eggs are easy to find & I wanted this to be a super simple recipe for you to replicate using things you can easily find at any grocery store. 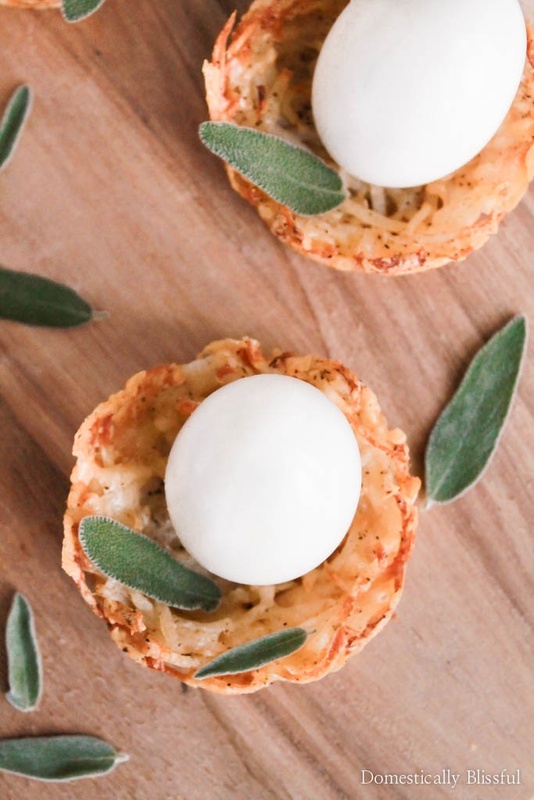 My goal was to create a savory brunch recipe that looked quintessentially like spring, but still easy enough that anyone could make it for their spring party or Easter brunch. And I think I achieved this! And in regards to taste… Yum! There is cheese in these hash browns so of course, they are going to be a crowd pleaser. 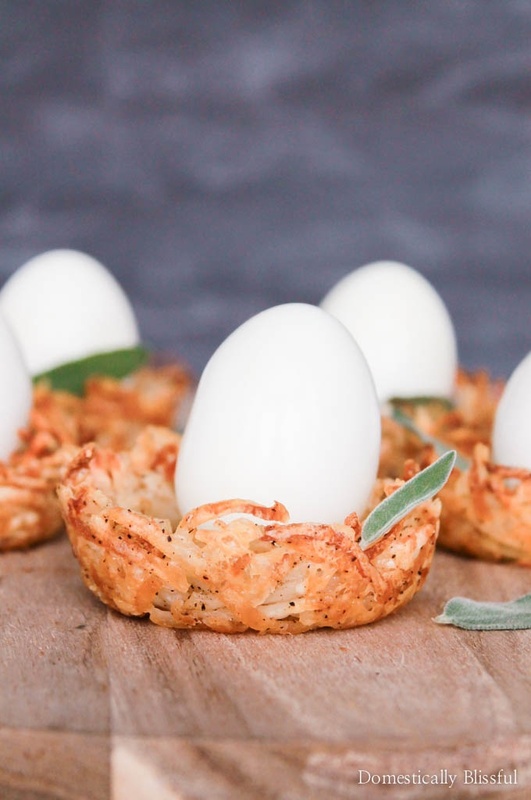 I especially love the crunchy golden outer shell of these hash browns birds nests. Plus they are so cute! I had almost as much fun photographing them as I did eating them! And bonus, they are crazy easy to create & work great as a last minute brunch recipe. I hope you enjoy making them & eating them as much as I did this spring! 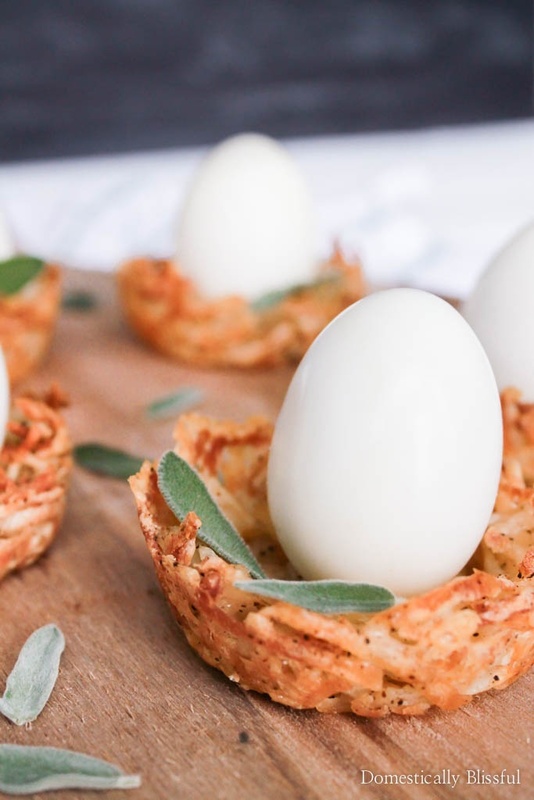 These individual Hash Browns Birds Nests are the perfect savory brunch recipe for spring & especially Easter! First, preheat your oven to 400 degrees Fahrenheit & spray your jumbo muffin tins with oil. Next, mix the hash brown potatoes, parmesan cheese, salt, & pepper in a bowl. Evenly distribute the cheesy hashbrowns between the jumbo muffin tins. Create the hollow shape of a nest with your fingers. Once baked, let cool & then carefully remove the hash brown birds nests from the muffin tins. 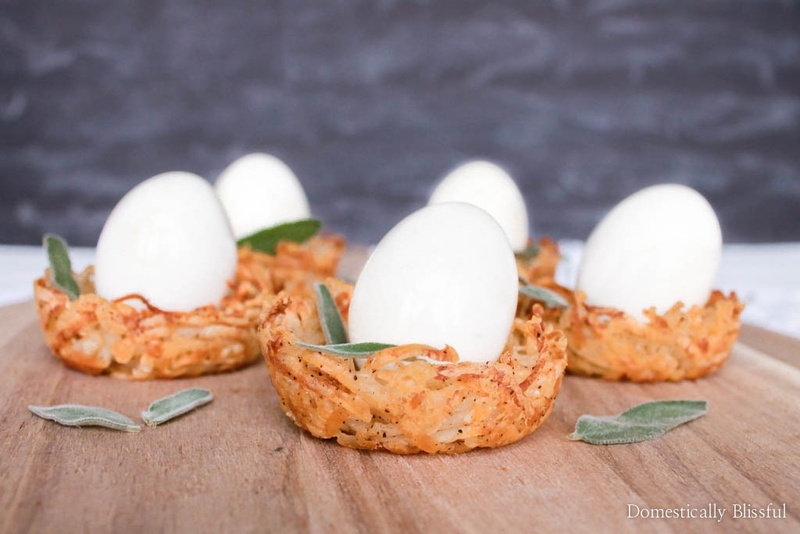 Place an egg in each nest along with a sage leaf “feather.” Serve immediately & enjoy! 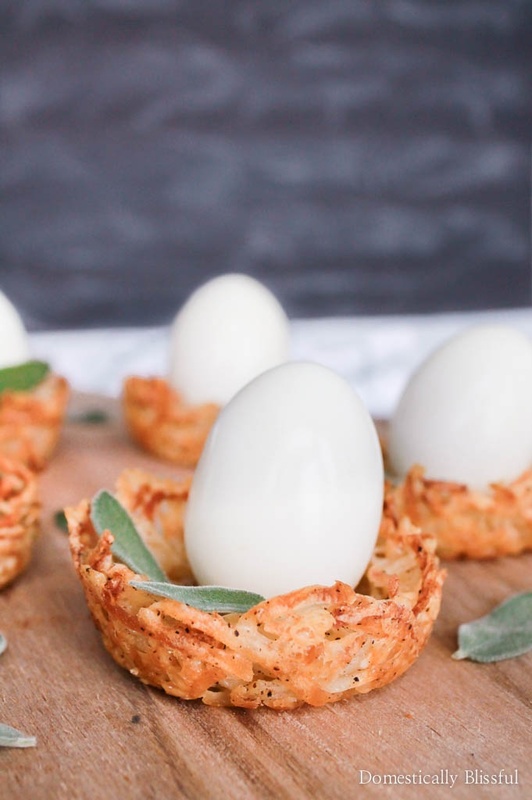 How will you serve your Hash Browns Birds Nests?